Botulinum toxin A, a purified protein made from botulism bacteria, binds to the nerve endings, preventing the release of the chemical transmitters that activate muscles. When injected into specific areas of the face, it paralyzes the small muscles that cause frown lines, crow’s feet, horizontal forehead creases, and other facial wrinkles. Botulinum toxin treatment decreases local muscle activity thereby preventing the appearance of “dynamic” wrinkles that are caused by repeated facial expressions. The effect generally lasts from four to five months. In some cases, after multiple treatments, results can last longer in between treatments. Beverly Hills Dermatology Consultants also uses Botox® to improve the appearance of fine lines above the lips. Vertical muscle bands in the neck can also be treated. 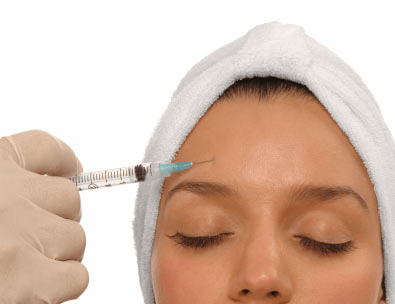 New uses for botulinum toxin continue to be investigated for their safety and effectiveness. Botox® is used to treat wrinkles which are caused by contractions of the delicate underlying facial muscles every time you smile, laugh or frown. The more emotion you show, the deeper these wrinkles and lines are likely to be. Botox blocks impulses from the nerve to the tiny facial muscles that are related to expression lines. Botox relaxes the muscles so they do not contract. This treatment can be used to reduce forehead lines, lines around the eyes, frown lines, and neck creases. It can also be used to create a browlift. After treatment, the overlying skin remains smooth and unwrinkled while the untreated facial muscles contract in a normal fashion, allowing normal facial expression to be unaffected. Botox injections can also eliminate excessive sweating of the armpits, palms and soles which is associated with anxiety for individuals suffering from this chronic problem. While sweating is the body’s natural, built-in cooling mechanism, many people struggle with a condition called hyperhidrosis. This can affect the underarms, hands, feet or face. Botox® can be injected to target the nerves of the sweat glands and effectively reduce excessive sweating. The upper third of the face is very responsive to Botox®. Forehead lines, furrows between the brows and lines around the eyes are smoothed after treatment. We are also using Botox® to relax bulging cords of the neck by injecting a small amount of Botox® into the muscles that cause expression. The goal is to weaken the muscles that contribute to aging and sagging and to strengthen the muscles that lift. The injections are relatively painless and the effect lasts from three to four months. Botox® is fully metabolized by the body so it does not remain in the system.